The gardens should be full of color with roses, wisteria, clematis and perennials in bloom. Oregon wineries and local breweries nearby. Garden tips and stories along the way. The spa at the resort and charm of Silverton makes this a great girls weekend as well. Need a roommate? We have a lovely lady looking for a roommate on this trip. Call us if interested at 360-825-6186. You can also pay a single supplement to have your own room. You don't need to be a gardener to enjoy this trip. Hiking, shopping, great food and wine are all close by the resort and their is even a shuttle that tours the gardens if mobility is a problem. You can park your car overnight in the fenced parking lot of Windmill Garden in Sumner, Washington. Bus leaves at noon on Friday, June 8th 2012 and returns by 5pm on Sunday, June 10th. Price: $380 per person, based on double occupancy, but if you need a roommate, we can help. Add $200 to the price if you would like your own room. Rooms are quite lovely, all ground level with mini frig, private patios and garden themed decor. The Garden University class will be taught by Marianne Binetti on Saturday morning. Then you can join Marianne for a group tour of the gardens or explore on your own. You can chose to join Marianne and Joe for dinner in town on Saturday night or stay at the resort and dine on your own. Nursery stops will be on the ride home Sunday. -specific nurseries to be announced. Our coach will have plenty of room for your purchases. P.O. Box 872, Enumclaw, WA 98022 Include your phone, address and email and we will send a receipt and contact you with more details. Sorry, this trip is full. But you can email us to get alerts on future trips. During most of our lifetime, politics has kept Russia and much of the Baltic region out of reach for travelers. Now we have a chance to finally see Pete’s wonder of water gardens, topiary, color and impressive outdoor art. 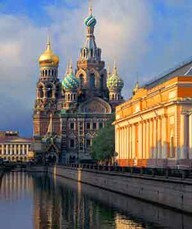 Plus we’ll discover the Hermitage museum and the beauty of the Baltic area. We’ve added some extra days in Copenhagen once the cruise ends. This is the home of the world renowned Tivoli Gardens and we’ll be staying in a hotel near the spectacular gardens and European Expo that is Tivoli. Two extra nights in Copenhagen will allow us time to really explore the gardens and outdoor entertainment, rides and sites of Tivoli with sight seeing in the beautiful city of Copenhagen. Then we’ll enjoy a group farewell banquet before heading home. Norwegian Cruise Line 9-night Baltic Capitals Cruise on the Norwegian Sun with all meals & entertainment. Two shore excursions are included in the price, and as usual we also have included all your daily tips, taxes, port charges, airport transfers and some surprise extras. 2 nights in Copenhagen with your entrance to Tivoli Gardens, hotel room, breakfast and farewell banquet are also included. Remember airfare is not part of the price so you can fly with the group, go early, stay longer or use up your miles. - Enumclaw Travel is making all travel arrangements and taking all payment so contact them about using airline miles, securing a spot on this trip with a deposit, and reserving the cabin of your choice on the cruise ship. Call 360-825-6531 and talk to Ellen. Pre-trip garden party in May and post trip reunion included - remember at the reunion we’ll enjoy re-living the trip through PowerPoint and you don’t have to worry about your camera failing on you - Joe will be taking photos on the trip and giving you all a photo CD. I’ll be telling you the tales of Russian and Baltic history, landscape design and the life of good old Linnaeus in private seminars on board ship - with dinners, book club meetings and other events for our group only. We are also working on de-embarking privileges for our private group excursions. You can stay busy with our group activities every day or choose to relax or explore the ship and ports on your own. It’s your vacation, enjoy freedom to do what you want. In ports where we do not have prepaid shore excursions you are invited to join Joe and I on walking tours. We plan to hire a local guide in a few of the ports and just split the fee among whomever wants to join us. Germany and Denmark and Helsinki Finland are also on our cruise itinerary and don't forget the 2 days in St. Petersburg and all the tours, gardens, museums and historical sites of that great city. P.S. Joe wants to see Iceland! We are thinking about flying on Icelandic Air (a great value, and partner with Alaska ) and staying one night (which in July means only 4 hours of darkness) to see some of the geographic wonders of this area. But only if it is a really great bargain. We’ll keep you posted on airfare and the Iceland stopover as it develops.